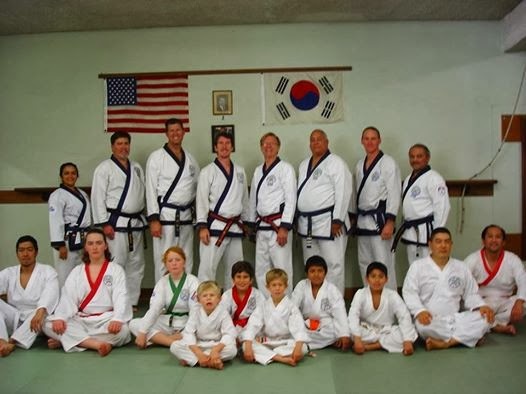 On Saturday May 30, 2015 six Miramar Martial Arts Academy's Soo Bahk Do® Ko Dan Ja candidates were promoted to the rank of Sa Dan by Master Instructor, Thomas Tung M Thai SBN. After many years of training with Thai SBN, my fellow Sa Dan candidates and I were welcomed into the ranks of Soo Bahk Do® Masters world-wide. This was a momentous occasion for all of us. Thank you Master Thai for the many years of dedicated instruction. Without your guidance and motivation, this could not have been possible. Congratulations to my fellow Ko Dan Ja who have made this journey with me. Now the real learning begins. The Concept of "Moo Geh"
Of all the things I learned at Ko Dan Ja, the most interesting was the concept of moo geh. I am not sure exactly how to translate moo geh into English, but the basic idea is "heaviness." You may have your own understanding of moo geh. But as I reflect upon the demonstrations performed at Ko Dan Ja, I believe there is only one meaning that applies to Soo Bahk Do. "Moo geh" is heaviness that comes from a direct connection with the earth and the energy that surrounds us. It is interesting to note that as practitioners we assume we are performing techniques correctly. 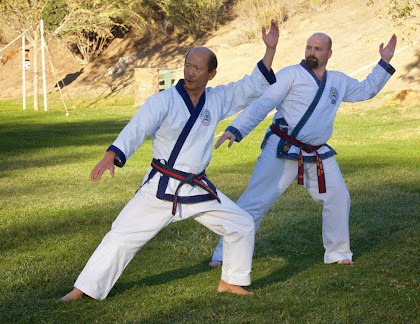 And then, we witness the same techniques performed by the Kwan Jang Nim. Recently, I made a series of videos for my students, thinking they might serve as a helpful guide to keep them pointed in the right direction. So I eagerly set out to document the White and Orange Belt forms, combinations and one-step sparring. After several hours of recording, I had captured the rank required material. Several more hours were consumed in post-production. The finished product was essentially okay for the purposes I had in mind; to give my students an easily accessible tool for reviewing required material. After reviewing my performance, I realized there was very little "moo geh" in my technique. To improve myself as a martial artist, I must take this lesson to heart. Teaching is a huge responsibility. Giving students the correct instruction is vital to the preservation of our art. They will only perform the way they have been taught. How we demonstrate "etiquette" and "protocol" will create a lasting impression in their minds. Embracing the concept of "moo geh" is paramount, though students may not immediately understand the connection between gravity and motion, or how to utilize that energy to enhance their techniques. It takes patience and years of practice. Reviewing my own performance, I see there is a great deal of patience and practice in my future. Soo Bahk!!!! When I received my invitation to attend the U.S. Soo Bahk Do Moo Duk Kwan Ko Dan Ja Shim Sa earlier this year, I had great reservations. Of course there were several personal reasons why I felt unsure about attending. One of those reasons was of course financial, the bane of most indecision to move forward on a path. Other reasons were more subtle. Having opened my own studio to train students in Soo Bahk Do, I found that opportunities to enhance my own training were very limited. Besides working a full-time job I was committed to providing my young students with the most attention I could provide. That undoubtedly cut into my own personal time for training. Another reason was connected to my emotion. My son, with whom I shared the responsibility of training students in our dojang, was inducted into the U.S. Air Force. He and I were partners, father and son. But his journey toward Ko Dan Ja had been cut short, delayed by circumstances. I felt a bit of guilt and sadness being his junior and given this opportunity before him. So when asked if I planned to attend Ko Dan Ja by my Master, my response was ambiguous. Receiving an invitation to Ko Dan Ja is a great honor. But I was conflicted. Could I really afford to pay for the week-long training and testing? Would I be prepared to meet the intense mental and physical challenges? Would I be proficient enough in technique and knowledge to succeed? These were questions that haunted me in those early days. Without knowing what the future would bring, I replied to Master Thomas Thai saying, "I am not sure that I will be able to attend Ko Dan Ja, but I will train as if I am." It was the only answer I could give him. And so I did. Each week I drove the 68 miles round trip from my home in Oceanside to my Master's studio in San Diego. I had to eliminate one of my student training programs, and rearrange the training schedule for my remaining students. Three to four times per week I made the journey, not knowing if fate would allow me to attend Ko Jan Da. Looking back I see there was courage in my decision. It was the right thing to do. I was honest with my Master, because I truly did not know what the future would bring. Having prepared myself mentally and physically made it easier when the time came to make the final decision. Indeed I was apprehensive. It was the unknown. I resolved to do my best and make the best of the experience. It was all that I could do. The Ko Dan Ja process unfolded in a way that I had not expected. True. The training was hard. The days were long and filled with content. But the process was smooth, well-organized and structured to ensure our success. We only needed the desire to improve, change and embrace the instruction. The mystique of Ko Dan Ja has faded, but the experience will live on forever. I have made new friendships and strengthened old ones. I have bonded with my brothers and sisters in Soo Bahk Do in a way I never thought possible. I am proud and honored to have been selected as a Ko Dan Ja Shim Sa candidate, and I am grateful to all those who made my experience a memorable and successful one. Soo Bahk!!! When I began my Soo Bahk Do® training in October of 1999, I had no idea how far my journey would take me. I only started training because of a promise I had made my son; that I would take classes with him if and when he was promoted to green belt. 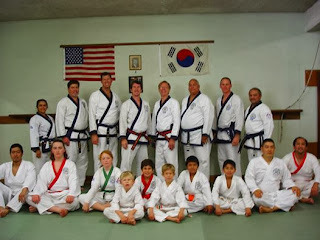 My son began training at five years old, two years before I joined Soo Bahk Do®. After observing other parents taking karate with their children, he asked me to take classes with him. I thought this would be a good opportunity to motivate him to continue training, so I made a promise. At that time he had just received his orange belt. Promoting up to green belt would require more focus and work hard. The reward would be his own personal achievement, as well as having his dad take karate with him. I did not see a distant future in Soo Bahk Do®. I had recently turned 48 years old, and was beginning to feel age creep upon me. I was not in the greatest shape at that time, but of course, I had made the promise. In October of 1999 I enrolled in karate class with my son. Soo Bahk Do® was not easy for me. As a youth I had studied Shotokan karate. It took 10 years to achieve black belt. Upon reaching that goal, my training became sporadic. Years passed without formal training, and I lost memory of the katas I had learned as a practitioner. I retained knowledge of most of the terminology and application of basic techniques, but I no longer considered myself a black belt. The hard style stayed with me, and as I began training in Soo Bahk Do®, I came to realize the vast difference between the two martial art forms. It was difficult to overcome my weaknesses, and the muscle memory developed as a Shotokan practitioner. But with continued practice and training, I slowly acclimated to the new art style. Today, I own and operate DeJohnette Martial Arts Academy. I am a certified instructor in the art of Soo Bahk Do®, and responsible for training new students. I do not know how much farther this journey will take me. There are many road blocks on my path; yet, I am determined to place one foot in front of the other for as long as I am able. This is the promise I have made to "myself." I hope this post finds you all in good health and spirits. I want to share a most recent experience and accomplishment in my Soo Bahk Do® journey. For the past two years, I have been training and studying for Kyo Sa Certification. For those of you who are not familiar with the ranking and levels of instructor in Soo Bahk Do®, I will make it simple. There are three (3) levels of instructor: Sa Bom (master instructor), Kyo Sa (instructor), and Jo Kyo (instructor assistant). Having just completed the Kyo Sa certification process I am offering to share my experience with you. As many of you may be my seniors, I do not profess to know or have all the answers, nor do I portend to advise or educate you in any way. I only offer my own experience with the Kyo Sa process. The current guidelines set by the Moo Duk Kwan® Federation for Kyo Sa Examination and Certification are undergoing several changes; therefore, some of the requirements may vary slightly in the future. There are two important documents that Kyo Sa Candidates receive from the Regional Examiner: 1) the Protocol for Kyo Sa Certification, and 2) the Model Class Feedback form. Candidates are required to complete three areas of the process before taking the Final Examination: 1) the Kyo Sa Manual, 2) the teaching logs, and 3) the Soo Bahk Do® Institute Model Class. Candidates should study the Model Class very closely, realizing that every aspect of instruction is important; not just the physical exercise and training portions, but also the application, partner drills, demonstration and student feedback. We trained 8 hours with the Regional Examiner to complete the physical portion of our exam. The teaching portions of the exam took place the following day along with oral questions and manual review. We were instructed to be prepared with our manual, paperwork, and at least 4 class outlines for 30 minute classes based on the Model Class Video. The Regional Examiner sent out a general invitation for students to show up to participate in the classes. We were forewarned that it would be a good idea to have a class outline for different ages and ranks, so we’d be prepared for whatever turnout we got. Even though I had prepared 4 different lesson plans, at one point I found it necessary to slightly modify my content to accommodate the huge variances in rank and age. Truthfully, the biggest area of confusion and concern was the Soo Bahk Do® Institute Model Class. Below are the details on how to complete that portion of the certification. Model Class Instructor Feedback Form needs to be made or notes should be taken and given by Instructor. I realize this is only a brief summary of my experience, but I hope it serves to give you some idea of the certification process. For me personally, seeking the guidance of both my instructor and the Regional Examiner was the most important factor in achieving success. Good luck in your Soo Bahk Do® journey. Tiger Tots must learn a series of karate techniques, including punching, blocking and kicking. Most important is the "Star Block" set, which incorporates seven distinctive movements. Rilynn mastered the "Star Block" set and demonstrated that she could perform it on her own! She also demonstrated the front stretch kick, front snap kick, and the two rainbow kicks! She was very focused and demonstrated good discipline, as she exhibited her skills. Rilynn is four-years-old. Great job, Rilynn! Master Darno V. DeJohnette, Sr., owner and senior instructor at DeJohnette Martial Arts Academy, is a 4th Degree Black Belt and Certified Instructor in the U.S. Soo Bahk Do® Moo Duk Kwan® Federation. He enjoys cinematography and occasionally produces martial arts videos under the name, Golden Dragon Productions ©. Master DeJohnette began his training in Soo Bahk Do® in 1999 under the guidance of Thomas M. Thai, SBN. He earned the rank of Cho Dan (1st Degree Black Belt) in 2006, E Dan (2nd Degree Black Belt) in 2008, Sam Dan (3rd Degree Black Belt) in 2011 and Sa Dan (4th Degree Black Belt) in 2015..
Master DeJohnette received Jo Kyo Certification in 2009. In 2010 he opened DeJohnette Martial Arts Academy in Vista, CA. In 2013 he received Kyo Sa Certification. His Dan Bon is 44400. Copyright (C) 2011-2016 Darno Von DeJohnette. Simple theme. Powered by Blogger.